Every 97 minutes, Hubble completes a spin around Earth, moving at the speed of about five miles per second (8 km per second) — fast enough to travel across the United States in about 10 minutes. As it travels, Hubble’s mirror captures light and directs it into its several scientific instruments. Hubble is a type of telescope known as a Cassegrain reflector. Light hits the telescope’s main mirror, or primary mirror. It bounces off the primary mirror and encounters a secondary mirror. The secondary mirror focuses the light through a hole in the center of the primary mirror that leads to the telescope’s science instruments. People often mistakenly believe that a telescope’s power lies in its ability to magnify objects. Telescopes actually work by collecting more light than the human eye can capture on its own. The larger a telescope’s mirror, the more light it can collect, and the better its vision. Hubble’s primary mirror is 94.5 inches (2.4 m) in diameter. This mirror is small compared with those of current ground-based telescopes, which can be 400 inches (1,000 cm) and up, but Hubble’s location beyond the atmosphere gives it remarkable clarity. As you might suspect, the marvelous Hubble Telescope is using technology that is considered outdated relative to what is available today. Still working and still providing remarkable photographs and data, the scientists and engineers at NASA recognized a newer device would ultimately be needed to push the boundaries of astronomy. Hence the James Webb Telescope. OK, just who is James Webb? The man whose name NASA has chosen to bestow upon the successor to the Hubble Space Telescope is most commonly linked to the Apollo moon program, not to science. Yet, many believe that James E. Webb, who ran the fledgling space agency from February 1961 to October 1968, did more for science than perhaps any other government official, and that it is only fitting that the Next Generation Space Telescope would be named after him. Webb’s record of support for space science would support those views. Although President John Kennedy had committed the nation to landing a man on the moon before the end of the decade, Webb believed that the space program was more than a political race. He believed that NASA had to strike a balance between human space flight and science because such a combination would serve as a catalyst for strengthening the nation’s universities and aerospace industry. By the time Webb retired just a few months before the first moon landing in July 1969, NASA had launched more than 75 space science missions to study the stars and galaxies, our own Sun and the as-yet-unknown environment of space above the Earth’s atmosphere. Missions such as the Orbiting Solar Observatory and the Explorer series of astronomical satellites built the foundation for the most successful period of astronomical discovery in history, which continues today. It is absolutely fitting that the next generation telescope be named after Mr. Webb. The graphic below shows an excellent comparison between Hubble and James Webb relative capabilities. JWST is an international collaboration between NASA, the European Space Agency (ESA), and the Canadian Space Agency (CSA). The NASA Goddard Space Flight Center is managing the development effort. The main industrial partner is Northrop Grumman; the Space Telescope Science Institute will operate JWST after launch. Several innovative technologies have been developed for JWST. These include a primary mirror made of 18 separate segments that unfold and adjust to shape after launch. The mirrors are made of ultra-lightweight beryllium. JWST’s biggest feature is a tennis court-sized five-layer sunshield that attenuates heat from the Sun more than a million times. The telescope’s four instruments – cameras and spectrometers – have detectors that are able to record extremely faint signals. One instrument (NIRSpec) has programmable micro-shutters, which enable observation up to 100 objects simultaneously. JWST also has a cryo-cooler for cooling the mid-infrared detectors of another instrument (MIRI) to a very cold 7 K so they can work. The JPEG below will show the instrumentation assembled into the platform and give a very brief summary of purpose. The telescope will be “parked” 932,000 miles above Earth into space; obviously, beyond our moon. With the ability to collect much more light than Hubble, the Webb Telescope will be able to see distant objects as they existed much earlier in time, specifically 13.5 billion years earlier. This number is only 200,000 years after the “big bang”. (ABOVE) The Webb Telescope in Orbit. Given below: The James Webb Telescope Team. On 6 July 2011, the United States House of Representatives’ appropriations committee on Commerce, Justice, and Science moved to cancel the James Webb project by proposing an FY2012 budget that removed $1.9bn from NASA’s overall budget, of which roughly one quarter was for JWST. This budget proposal was approved by subcommittee vote the following day; however, in November 2011, Congress reversed plans to cancel the JWST and instead capped additional funding to complete the project at $8 billion. The committee charged that the project was “billions of dollars over budget and plagued by poor management”. The telescope was originally estimated to cost $1.6bn but the cost estimate grew throughout the early development reaching about $5bn by the time the mission was formally confirmed for construction start in 2008. 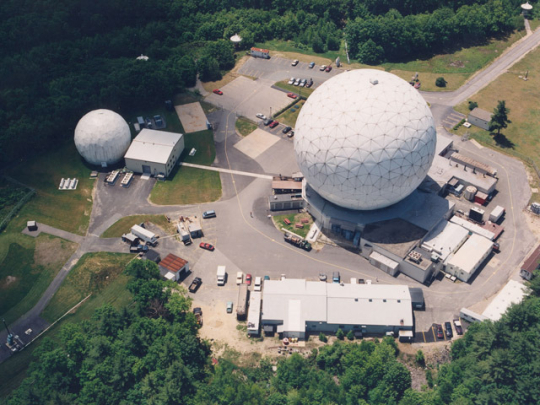 In summer 2010, the mission passed its Critical Design Review with excellent grades on all technical matters, but schedule and cost slips at that time prompted US Senator Barbara Mikulski to call for an independent review of the project. The Independent Comprehensive Review Panel (ICRP) chaired by J. Casani (JPL) found that the earliest launch date was in late 2015 at an extra cost of $1.5bn (for a total of $6.5bn). They also pointed out that this would have required extra funding in FY2011 and FY2012 and that any later launch date would lead to a higher total cost. Because the runaway budget diverted funding from other research, the science journal Nature described the James Webb as “the telescope that ate astronomy”. However, termination of the project as proposed by the House appropriation committee would not have provided funding to other missions, as the JWST line would have been terminated with the funding leaving astrophysics (and the NASA budget) entirely. You can see from the following digital, Congress was certainly within their right to cancel the program. It is not an inexpensive program. The House of Representatives, as mentioned above, did not kill the program. Launch is still scheduled for 20 October, 2018. I personally believe this was the proper move for them to make. As always, I welcome your comments. I can’t stand dirt. Dirty house, dirty car, dirty office, and I am making some changes. Fortunately, my wife is a “neatnick”. She also—CAN’T STAND DIRT. To further demonstrate the point, one evening, just before sundown, she looked through our den windows towards the setting sun and pronounced “we WILL clean these filthy windows inside and outside tomorrow”. I felt her “pane”. (Pardon the clever play on words!) Dirt is one thing, but I’m OK with a little clutter. I have several editions of Machine Design, Design News, Science and Technology, etc. sitting around waiting on the spirit to move me towards picking them up to read. The older ones I consider collector’s items. This is perhaps the only way I cannot be considered a hoarder. 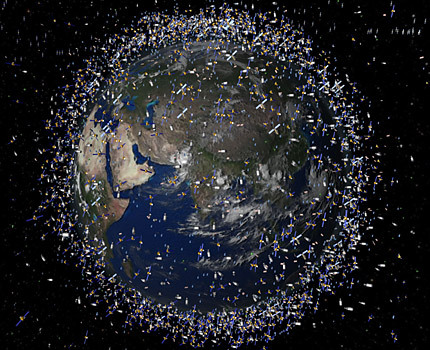 The digital photograph above shows the approximate position of debris remaining as a result of exploits in space, both ours and other countries, having the technology to launch rockets that carry payloads. 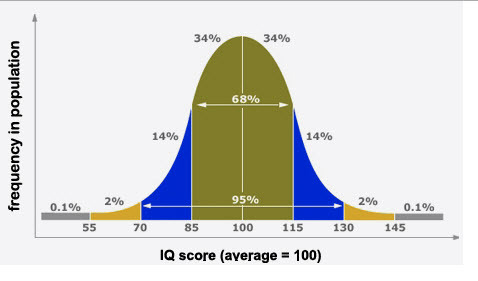 Perhaps a more enlightening JPEG, given below, will be more helpful and further illustrate the issue faced by NASA and other space-related agencies. Please keep in mind all objects are moving. None are stationary; consequently, any depiction of position must be an estimate of position. It has been estimated by Hugh Lewis from The University of Southampton that over this decade, there could be as much as a fifty percent (50%) increase in debris. Already, the International Space Station has had to fire thrusters to avoid moving “garbage” orbiting earth. The result would have been disastrous had this action not been taken. Some experts from NASA and within several university systems state we have already reached the “tipping point” and corrections would be virtually impossible and remarkably expensive. NASA estimates there are at least 500,000 pieces of debris orbiting earth and some of that debris is moving at 17,500 miles per hour. Of course, any “strike” at these speeds could produce life-threating damage to personnel and systems. 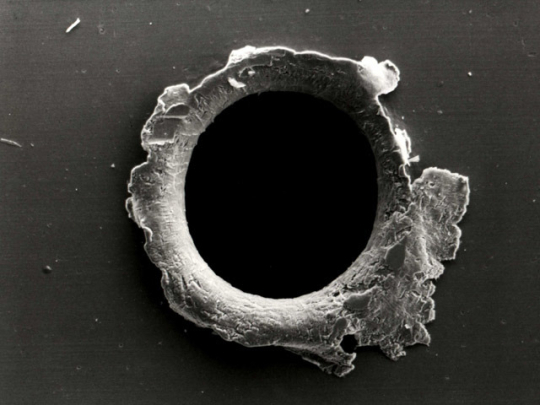 Damage such as the one shown below could absolutely destroy delicate equipment and seriously injure, if not kill, astronauts. An unestimated number of particles, mostly dust and paint “chips” resulting from collisions that have occurred with larger objects also orbiting. Some “guesses” put that number into the millions. Lost equipment; i.e. cameras, tools, measuring devices, fabric hold-down straps, nuts, bolts, cotter pins, etc. Rocket boosters that orbit yet remain in space. Some, over time, experience decaying orbits, eventually falling to earth. Satellites that no longer function but still orbit in LEO (Low Earth Orbit) or HEO (High Earth Orbit). Generally satellites operate between 435 to 800 miles above the earth. When these satellites “die”, they do not accomplish reentry but simply stay aloft as dormant objects. 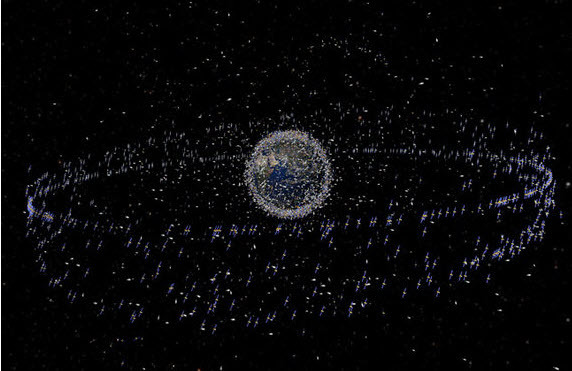 Think of the number of telecommunication devices now orbiting the earth. Most will eventually fade and no longer fulfill their purpose, being replaced with newer technology. With an ever increasing number of launches, engineers and scientists are designing into their products, systems that will provide for ultimate reentry when that system or component performs its function. Let’s assume a satellite has performed properly for nine years but now is dormant due to programmed obsolescence. What if, pulse jets could fire altering trajectory and orbit so reentry could be possible? If that reentry could be a controlled, one “chunk” of debris would be eliminated; consequently, eliminating possible damage to other orbiting bodies or future launches. This is the current mind-set being explored. Facilities such as this can at least estimate collisions and, more importantly, any debris that may be in a decaying orbit that will eventually create reentry into earth’s atmosphere. Over the past ten to fifteen years several large pieces of debris have reentered although most fall into our oceans or uninhabited land. It becomes ever so critical to remain aware of location to preclude injury on the ground or provide successful future launches. Several government agencies, as well as universities, have undertaken programs to explore methodologies to reclaim or at least deflect debris that might be potentially dangerous. Monetary estimates, technical risk and overall complexities of design are significant, and we seem to be a long way from even mounting demonstration programs that will indicate possible success. This is one area that will be fascinating to watch over the next twenty years. Stay tuned.